This year saw MBIS participate in the International School Hyderabad Choral Festival for the second time. As last year, under the direction of a guest conductor, our students had to learn and memorise music (and choreography!) in a very short space of time for a performance. Building on our experience, this year we were able to showcase the talent in MBIS by performing a song on stage by ourselves (see it here). Some of our girls auditioned for solo parts for the final performance and Umayra (MYP1) and Prisha (MYP4) did us proud by getting through. This year, we had the opportunity to sing with, and listen to performances by, an award-winning choir from Shillong; there was also an amazing 10 year-old pianist! It an amazing experience and inspiring for us all to hear and watch such young talented singers and musicians work. There is no doubt our students gained a lot from the entire experience and we look forward to the next Festival! Going on this trip for the second time in a row, I was very excited to meet all of the friends I had made last year and to enjoy my time with them. Similar to last year, we had two days in order to learn and perform four songs with several parts. However, this year it was slightly different as the parts were taught all together in order for us to listen to each other. I found this a great way of teaching these songs and we managed to learn all of them very quickly. Overall, I really enjoyed meeting all of my old friends, becoming closer with people of my own school and even making new friends in Hyderabad. While slightly tiring and exhausting, the choral festival was a great event where I saw several talented choirs and performed with people from different schools. I hope to attend this festival next year. Even after all the exhaustion,this trip was really an awesome experience. This was my first trip to Hyderabad and I had really enjoyed it. I had made new friends and saw some really nice performances from different choirs. I had also performed with many different schools and it was really nice to be a part of the choir and will for sure think about coming again next year. The 2018 Choral Festival was as engaging and fun as it was last year, and was one I am thankful to have gotten the opportunity to attend. 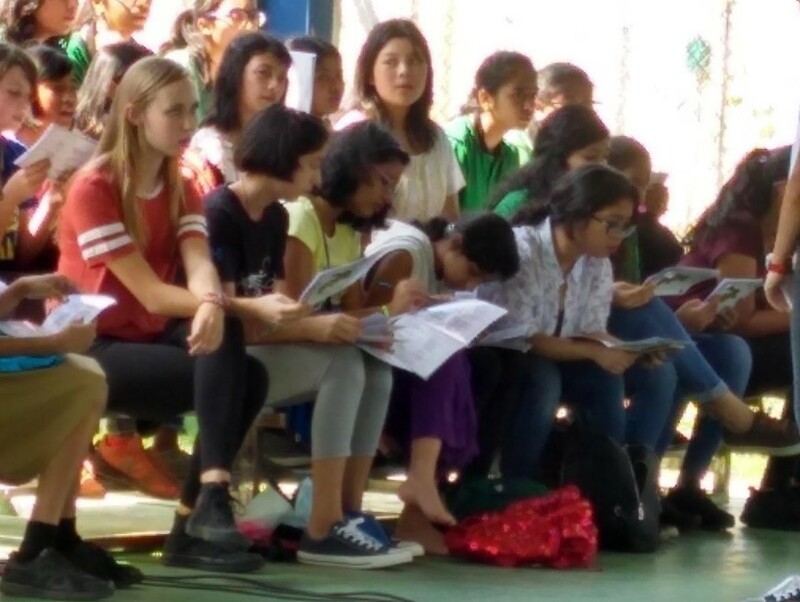 We learnt four different songs along with some singing techniques, which allowed us to experience what singing in a choir feels like, especially since there were various parts to it– soprano, alto and melody. Unlike last year, our MBIS choir also prepared a piece to perform, called ‘Pure Imagination’ from Willy Wonka and the Chocolate Factory. Throughout the festival we all got to make new friends, listen to talented choirs and learn from different teachers and special conductors. This was overall a great experience I hope to take part in next year as well.